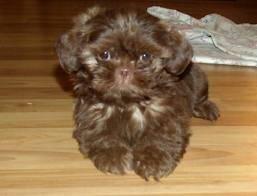 I have 2 chocolate Shih tzu puppies they are adorable , playful , love to cuddle and play. Shots, de wormed and ready to go to their new home. I also have one Black male with a tad bit of white on his chest.